There is something about listening to a singer who knows how to infuse each and every phrase of a song with authenticity and when she is accompanied by superbly orchestrated musicians playing exquisite arrangements that puts you right in the middle of the scenes that she has vividly brought to life. 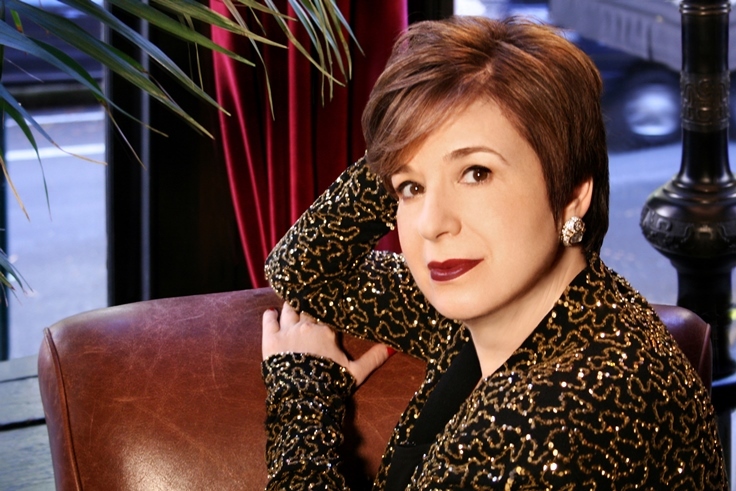 Celia Berk’s interpretation of the songs on her current album Manhattan Serenade accomplishes all of that. The collection of thirteen songs by composers and lyricists such as David Heneker, Irving Berlin, Richard Rodgers / Lorenz Hart, Cy Coleman and David Zippel and others is Ms. Berk’s love letter to the city she has lived in and around her entire life. This is home for Celia Berk and in the midst of the hustle and bustle and masses of people she finds beauty and peace. That is really what this album Manhattan Serenade is all about. It is about a woman who was born in Manhattan and grew up on Long Island, before eventually moving back to New York City, as an adult. As a young girl her mother would take her to the Opera on Saturdays and Celia Berk’s father inspired within her a love for the Great American Songbook. “My mother took me to the Opera and she started out when she first came to the city and they had a subscription at the Metropolitan Opera. My father, because he commuted all week long into the city, the last thing that he wanted to do (was come back to the city) on a Saturday afternoon. Frequently I was the one who went with my mother. I saw some of the absolute greats doing the Opera repertoire. That was my whole life,” she remembers. 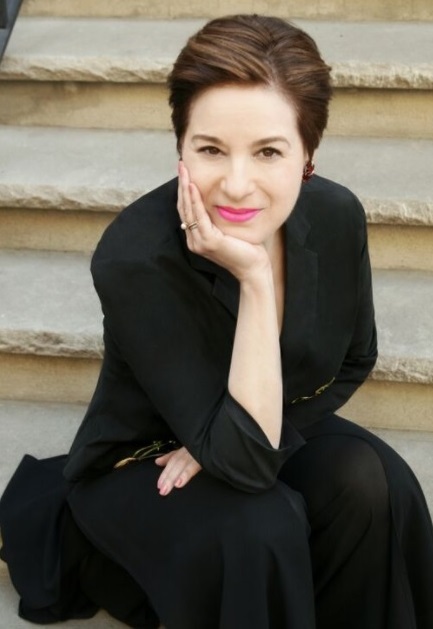 Ms. Berk is a mezzo-soprano with a three octave range who has become celebrated in New York City as a Cabaret singer, but whose lavish vocals are genre bending and threaten to break those boundaries altogether. For Manhattan Serenade she is expertly guided by producer, arranger and conductor Alex Rybeck and Tony Award winner Scott Lehrer who acted as the sound engineer and co-producer. Both gentlemen also worked with Ms. Berk on her debut album You Can’t Rush Spring. “Manhattan Hometown,” opens the album and the best way to describe Celia Berk’s performance is that is like being in the front row of a major theatrical production, without being overhyped or overly dramatic. Our questions are when is Hello Dolly going to be reprised on Broadway and when is Celia Berk going to be cast as Dolly Levi? She is simply superb while singing David Heneker’s “Manhattan Hometown,” originally performed by Ann Morrison in the 1984 musical Peg. Celia Berk talks about selecting this song for the album, “Alex knows Ann Morrison very well. There was not any sheet music for “Manhattan Hometown,” but when Alex reached out to Ann she very kindly sent us her marked up original score. Ann Morrison’s story behind the song “Manhattan Hometown,” is encapsulated on the website for Celia Berk and we have permission to share it here. Ms. Morrison says, “Peg was American-produced but British-owned. The music and lyrics were by dear British composer David Heneker, known for his musical Half a Sixpence. When I was cast as the lead, Peg O’Connell, he hadn’t finished the score. I was asked to do backer auditions and to spend time at the Cooperstown, New York, home of Louis Busch Hager, the American producer, along with the creative team. Ms. Berk talks about her relationship with New York City, “The fact that it is so big and that there are so many people that if you want to disappear into it and just be one of millions of people you can do that. I have been lucky enough to travel all over the world and there are places that if you aren’t dressed like everybody else people turn around and look at you and you feel very exposed. You can do anything; wear anything (in New York City). If I am walking down the street singing lyrics and if I look like I am talking to myself nobody pays any attention. You can have that anonymity. You can find your solitude in various ways and your privacy even when you are surrounded by lots of people and in some ways, because you are surrounded by lots of people. It works for me. Celia Berk has a penchant for recording what she refers to as hidden gems, songs that are less known to audiences in general. She explains why, “It is partly because the better known standards have the most incredible recordings and it is hard work to push some of those iconic voices and interpretations out of your head and for you to create space for what you think the song is about. When I do not have to push some of those interpretations out of my head then the listener does not have to push them out of their heads. That clears the space for a song to be heard for the first time. Even with well-known standards I imagine what it must have been like to hear these songs for the very first time. I imagine having heard them for the first time in whatever context they were in, whether they were a part of a score or they were individual songs that had been released. Ms. Berk talks about why she made that decision, “When you are giving the listener or an audience a lot of material that they are not familiar with you need to give them a break mentally (and let them listen to a song) they know really well. That was one of the reasons that we went looking for something that was familiar to people. Because it was familiar you can do things to it that you might not do to a song that people might not know yet. If it is something that hasn’t been recorded or hasn’t had a lot of recordings you want to give keep it true to the way the writer wrote it, but with “Up On the Roof,” you can strip it down and do something different with it. “Seconds,” with a song written by the mostly unlikely of co-writers, Burt Bacharach (music) and Neil Simon (lyrics) is a song that to an extent is set in another day and time, before wristwatches and clocks were replaced by cell phones, computers and other devices. The song was written for a planned, but never produced film version of the Broadway musical “Promises, Promises.” It is a beautiful song and Ms. Berk’s performance is worthy of a standing ovation. Can you give a standing ovation to a record? There must be an emoji for that! If there isn’t there should be. This is a song about missing that one to whom you hoped your heart would belong to forever and missing that person by mere seconds. The last line of the song expresses a longing for what might have been touched by a faint smile, while remembering that romantic figure from the past. Celia Berk says, “That (“Seconds”) is the one that I always cite as the ultimate compliment that Alex could have paid me, because he just venerates Burt Bacharach. I can’t think of any other word. When he handed me this song, I said you are going to let me sing a Bacharach song? I don’t think anyone would think that is exactly the vibe that I instinctively bring to a song. He trusted me with this song and it is a hidden gem. It is sophisticated (without) necessarily being a New York song, but it is a New York song about getting caught in traffic and not being able to get to the person that you are (supposed) to meet. I also like it, because it is frozen in time. Today you would just pull out your cell phone and text somebody and say that you are stuck in traffic. That song wouldn’t even exist the way it was written anymore. “Manhattan Madness,” well it is simply mad! We don’t mean angry, we mean crazy in a good way! It is a very quick tempo song by Irving Berlin and featuring Vince Giordano and the Nighthawks. The last track from the album that we talked about is the pairing of two songs “The Romance of a Lifetime,” and “The People That You Never Get To Love.” The former is a Kurt Weill and Sam Coslow song originally written for the film You and Me. It was a song that Celia Berk first heard while attending a concert with a friend. “The People That You Never Get to Love,” was written by Rupert Holmes. It was at the suggestion of Alex Rybeck that they paired the two songs. They later sent the pairing to Rupert Holmes who liked what he heard. “I frequently get I didn’t know that “The People That You Never Get to Love,” has another verse. I go it doesn’t, that’s Kurt Weill, but they look like they were looking for each other across a crowded room. They just belong together. These two songs are star-crossed lovers. They might have missed each other if we hadn’t brought them together,” then we suggest that Ms. Berk and Alex Rybeck are a dating service for songs and she laughs and says, “Yes, that is a great observation. I think we are. On the first album we’ve got “Penthouse Serenade” and “Stairway to the Stars,” (paired). When you put two songs together and they complement each other, They are not just two songs that are exactly the same. It is like you are turning the lens and looking at the same thing from a slightly different angle,” she says. As we write this Christmas 2017 is just around the corner and for some Christmas is a time for creating new memories, while for others it is a time for nostalgia. 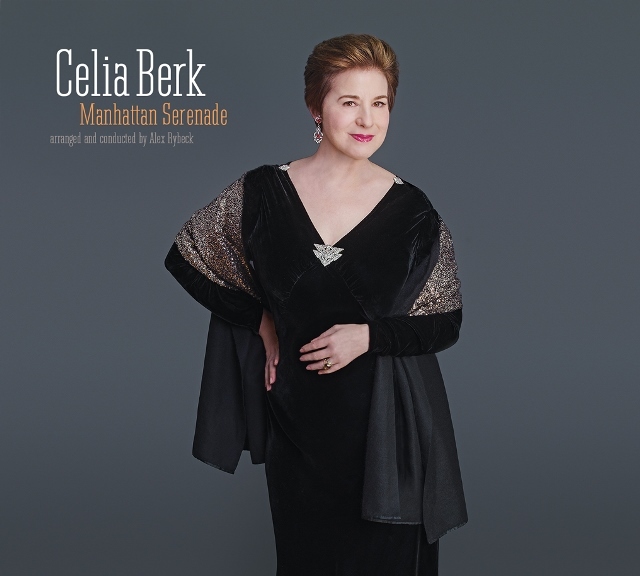 Celia Berk’s album Manhattan Serenade presents you with the opportunity to do both. It sounds like a great Christmas present to us, if not for someone you know, how about an early Christmas present for yourself.